Making the best bacon cheeseburgers is more than slapping some bacon on top of a burger patty. 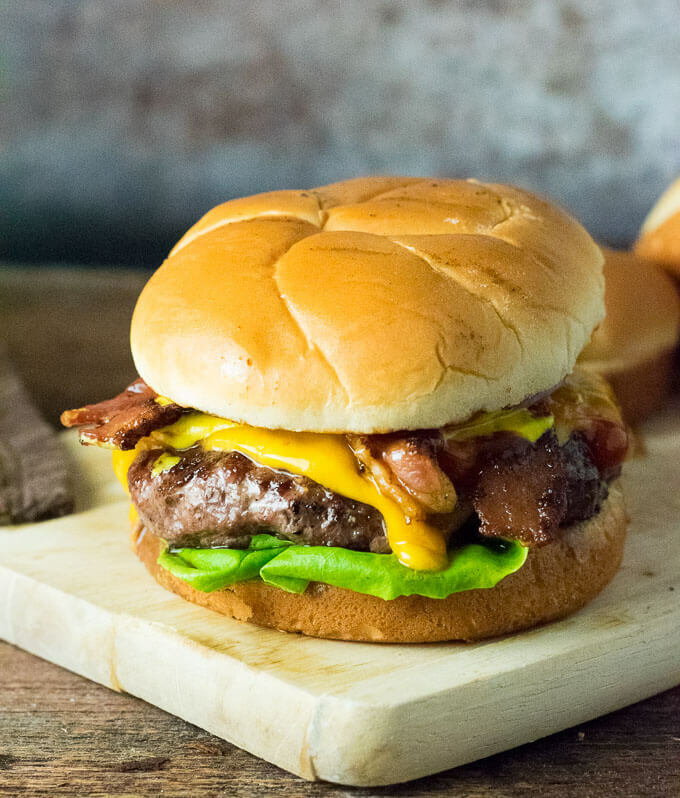 Follow these tips and tricks to make the BEST bacon cheeseburgers. Today we are going to talk about my favorite subject – burgers! I would eat them in a house, I would eat them with a mouse, I would eat them here or there, I would eat them anywhere! Like my poem? I just made that up, I swear. Bacon cheeseburgers are easily my favorite burger, and I take them very seriously. 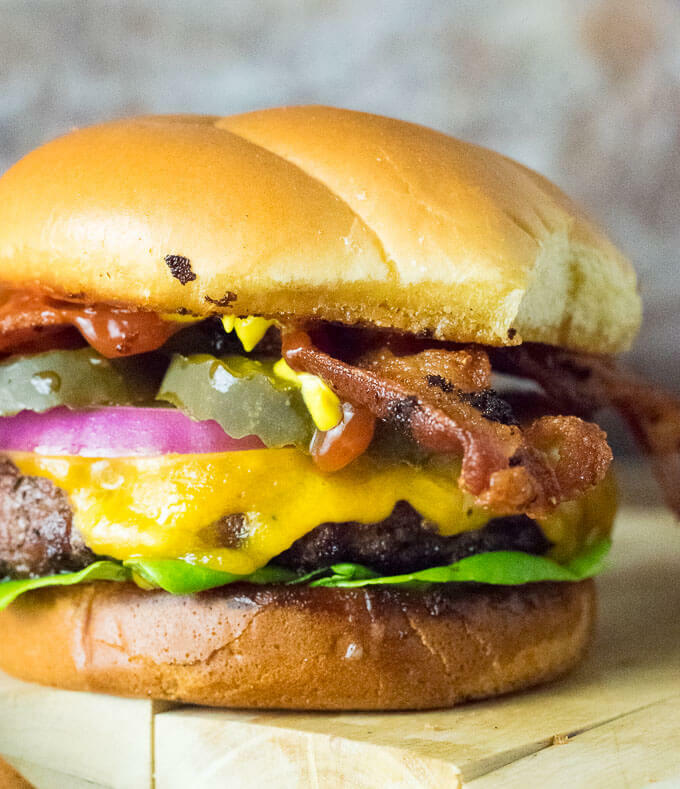 Each bite of this mouthwatering burger has been carefully curated and crafted to ensure the proper ingredient provides the perfect texture and flavor. It isn’t as hard as it sounds, let me show you how! Creating tender burger patties is the secret to crafting mouthwatering burgers. The key is to mold the meat as little as possible so it does not compact too much, which will create a denser burger. Always use freshly ground beef from your butcher, not the compacted ground beef stuffed into tubes. Since the fresh ground beef hasn’t been compacted for storage and sale, it will create a more tender burger. You are looking for beef that 80% lean, 20% fat, known as 80/20. Ground chuck typically contains this ideal fat ratio and has good flavor. To create a patty, separate the beef into chunks the size of your burgers. I use a digital kitchen scale to create equal-sized burger patties. Then gently form them into rounds with your hands, only pressing firmly enough to get the meat to hold together. Finally, take a flat object, like the bottom of a plate and press firmly onto the beef rounds to flatten into the shape of a patty. The patties will shrink as they cook, so make sure they start out wider than your bun. I also keep wax burger paper on hand to prevent the patties from sticking when pressing them. Parchment paper and aluminum foil would probably also work. For even more tips, check out my tutorial for how to make burger patties. Obviously, a bacon cheeseburger is only going to be as good as the burger patty. The best burger patties have a nice crust on the exterior, while the inside is perfectly juicy. To help create a crust I like cooking my burgers in a couple tablespoons of oil, bacon grease is great. I typically cook burgers on medium-high heat, but that will vary depending on your stove. My old stove required me to cook on high heat. It is best to only flip your burgers once, and never press on the burger patty with your spatula to help it cook. You are expelling all of the juice and creating a dry burger! Burgers can be cooked like grilled steak to the internal temperature of your choice. The best bacon for making bacon cheeseburgers is thick cut bacon. It has a crisp meaty texture that really stands out when assembled onto a burger. If you want my recommendation on the best bacon brand, Nueskes out of Whittenburg, WI is my hands down favorite. However, I suspect it may be difficult to find in other areas of the country. 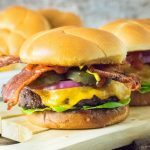 Mild cheddar cheese is my favorite cheese for a classic bacon cheeseburger. Admittedly, this can be subject to some debate as taste preferences will vary. However, mild cheddar provides that classic creamy cheddar flavor without the overpowering tang sharp cheddar imparts. I think sharp cheddar has its place on gourmet burgers, but mild cheddar is best for replicating that classic burger flavor. Too many times I have seen a single piece of lettuce ruin a perfectly good burger served at a restaurant. Yes, I am looking at you, romaine! Romain lettuce is a terrible choice for a burger because its thick crunchy vein throws off the taste and texture of the burger. Instead, use green leaf lettuce. It is mild in flavor and has a pleasingly tender texture. Butter lettuce is another fantastic option, though it can be harder to find. If you are trying to replicate fast food burgers, then iceberg lettuce is acceptable too. As you may notice by the pictures, I don’t really like tomatoes on my burgers, so I didn’t even bother putting them on the burger for photographing. However, tomatoes are still a classic burger topping and the best tomato for the job is a beefsteak tomato. Beefsteaks are wide tomatoes that are not overly juicy, so one hearty slice can cover a burger patty and not soggy up the bun. You get bonus points if you use fresh heirloom tomatoes, as they will have infinitely better flavor than grocery store varieties. Other classic toppings include onions and dill pickles. I prefer red onions for the pungent flavor they provide, but sweet onions work just as well. Like any burger, you can always add or subtract toppings to match your tastes. Finally, let’s talk about the hamburger bun because any ol’ packaged bun simply will not do. In my opinion, the best hamburger buns are brioche buns. They are slightly sweet tasting, light, airy, and moist. They provide exceptional texture without getting in the way of the burger. Stay away from dense buns, like Ciabatta, which will quickly overpower the texture of the burger. Brioche buns used to be hard to find, but thankfully most grocery stores are carrying them now. However if you cannot find them, pretzel buns are a good alternative, and I really enjoy Potato Buns too, like the Martin’s brand. The final important, and often overlooked, step to making the best bacon cheeseburgers is toasting the bun! Don’t skip this step, because it really makes a big difference. Butter the inside of the buns liberally and then toast until golden brown in a skillet. This creates a lot of great flavor and really improves the texture. I hope the above tips opened your eyes to some of the idiosyncrasies involved in elevating the classic bacon cheeseburger from blah to best! 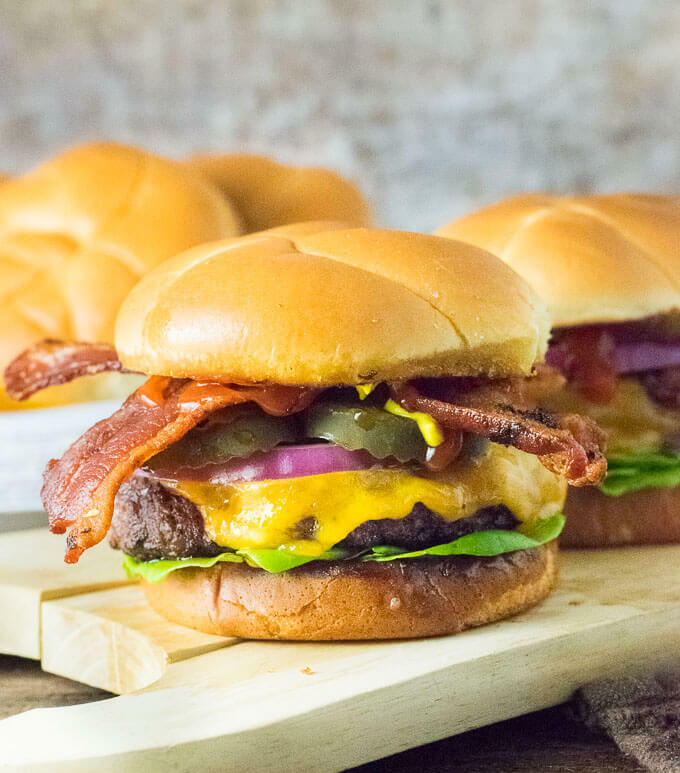 Now you just have to grab your ingredients and follow along with the recipe below, and I promise you, you will be able to make bacon cheeseburger better than most restaurants in your neighborhood! Enjoy. 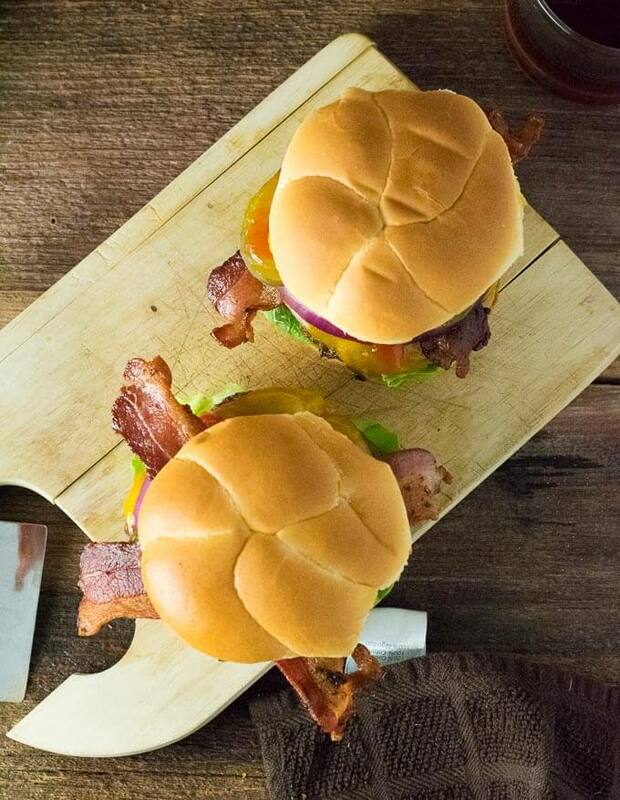 Making the best bacon cheeseburgers is more than slapping some bacon on a burger patty. Follow these tips and tricks to make the BEST bacon cheeseburgers. Using freshly ground chuck, separate into 3 equal chunks then gently form into a loose round ball. Using a flat object, like a plate bottom, press firmly on each round of beef to flatten into a patty. The patty should be at least an inch wider than the bun as it will shrink while cooking. Sprinkle liberally with salt and pepper. Heat skillet over medium heat and cook bacon until crispy. Flip the bacon to cook evenly on each side. Remove bacon from pan and set aside. Reserving approximately 2 tablespoons bacon grease, turn up the heat to medium-high heat and add the burger patties. (Cooking one at a time if needed). Cook until the top of the burger begins to darken in color to a deeper red, then flip. The bottom should have a nice crust, without being burnt. Adjust the heat as needed. Top burger patty with cheese and continue cooking until the bottom forms a nice crust and the interior reaches your desired level of doneness, then remove from skillet. While burgers are cooking, butter the interior of each hamburger bun and toast it until golden brown in a separate skillet. Assemble burgers by placing lettuce on the bottom, then burger patty, onions, pickles, tomato, bacon, and condiments. Top with the other half of the bun and serve immediately. Tip: Using wax paper helps prevent the burger patties from sticking when pressing them flat. The cheese should melt just fine on its own, but you can briefly cover the pan with a lid to speed up melting if needed. Placing lettuce on the bottom helps shield the bun from the burger juices, preventing it from getting soggy. I recommend ketchup and mustard for a classic bacon cheeseburger, but you can certainly use mayo or your favorite burger sauce. IF YOU LIKE BACON CHEESEBURGERS you will want to check out my Bacon Jam Burger. It tastes insane! 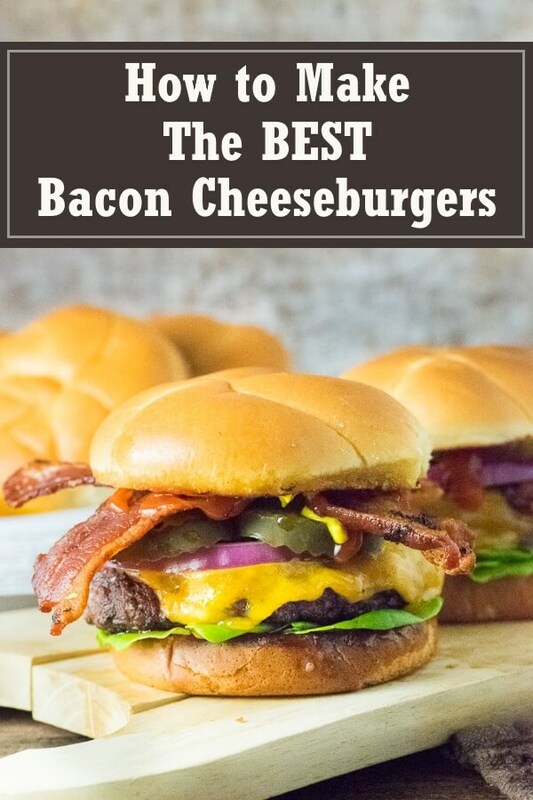 If you enjoyed How to Make the BEST Bacon Cheeseburgers then you should probably like me on Facebook and follow me on Pinterest too. That’s what I would do at least, because if you don’t get to know me but you still use my recipe it is kind of like taking candy from a stranger, and your mom taught you not to do that. Don’t disobey your mom, subscribe to Fox Valley Foodie today. It’s so nice to have a recipe that anyone can understand. Especially with the good old standard mild cheddar cheese, and not some fancy smancie exotic type of cheese. Thanks for the info on the proper bun to use also. Martin’s potato buns, that’s something i could get into real easy. Thanks for the feedback, that is good to hear. Sometimes simple is best!